A business expert has warned against hopes of reviving the South West Film Studios in St Agnes. £1.8m of European funding was ploughed into the project before it went into liquidation in 2004. Liquidators say £220,000 of unspent Objective One money from the studio project could be made available to firms willing to reopen the studios. But Professor Peter Gripaios of Plymouth Business School said other projects should benefit. He said: "Most of the film production facilities tend to be in London. "I understand that the government offices would like to get over the embarrassment of the last project, but there is a danger of throwing good money after bad. "I hope it works, but one would have one's doubts." 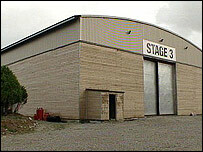 The closure of the half-built studios was the European funding programme's most high profile failure in Cornwall. But Toby Parkins, a local businessman and councillor at St Agnes, backed efforts to revive the studios. He said: "If they pull back they will lose money but if they put in the money allocated for the studio then there is a chance it will succeed." Meanwhile creditors are still waiting to get their money back. Guy Mitchell, whose security firm is owed thousands of pounds, said: "If we were able to get what is owed to us back to reinvest in the company that would be good. "We would like to return and provide a service to new people." Objective One declined to comment, but the Government Office South West confirmed that it was looking at ways in which the money could be transferred to new owners if they complete the studios.